ROBERTSDALE, Alabama – Nov. 8, 2018 – Nationally, the housing market is seeing a bit of a slow-down, compared to months past; however, Baldwin County home prices continue to rise, and the days on the market continue to fall. 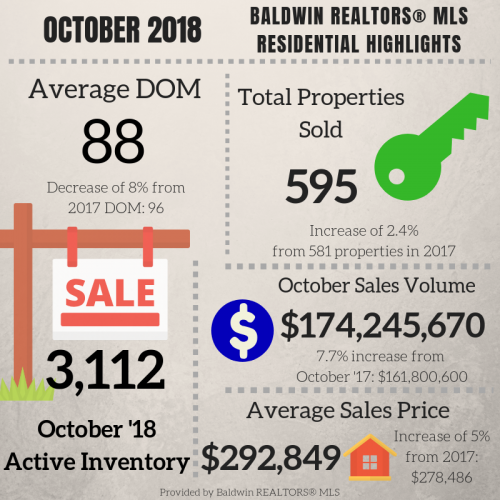 The total amount of residential active inventory in October 2018 was 3,112. 595 properties were sold last month, an increase of about 2% from October 2017: 581. Properties are staying the market for less days from 2017: decreasing 8% from 96 days last year to 88 days in last month. October total sales volume increased almost 8% this year, $174,245,670, from $161,800,600 in October 2017. The average sales prices of residential properties in Baldwin County this month increased 5% from 2017. Last year, the average sales price was $278,486, and this year, $292,849.